The office staff was great, and Dr. Parikh was very thorough, pleasant and professional. She took the time to explain everythingclearly, and answered all my questions. I felt very comfortable throughout the entire visit. The office staff was great, and Dr. Parikh was very thorough, pleasant and professional. She took the time to explain everything clearly, and answered all my questions. I felt verycomfortable throughout the entire visit. Dr. Parikh is a very professional and talented medical professional. It is a pleasure to be seen by her and heramazing staff. Dr. Parikh is a very professional and talented medical professional. It is a pleasure to be seen by her and her amazing staff. Dr. Parikh finished residency in Internal Medicine from Mount Sinai School of Medicine - Queens Hospital center. 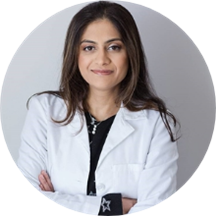 She completed her fellowship in Endocrinology, Diabetes and Metabolism from Beth Israel Medical Center, NY. She worked as a faculty member at Mount Sinai Medical Center and Icahn School of Medicine in the division of Endocrinology. She has also worked at Hackensack University Medical Center, NJ. Dr. Parikh has published and presented research on a variety of topics. Dr. Parikh is a caring endocrinologist and specializes in treating hormone disorders. She manages patients with diabetes, thyroid disease, polycystic ovary syndrome, osteoporosis, pituitary and adrenal dysfunction. She has special interest in treating diabetes, obesity and osteoporosis. She has been a long time resident of Bergen county and is also currently involved with many local community outreach programs and clinics. Great And Kind Staff. Awesome. It was the first visit and so far I am satisfied. Doctor listened and asked a lot of questions to clarify and assigned in depth diagnostics with different tests to see the full picture. So far so good Thanks. Dr. Parikh is great! Listened to me carefully, asked relevant questions, and really made me feel heard-- which is not always a given with doctors, unfortunately. The office staff was also very friendly and helpful. I would definitely recommend. After having gone to two other endocrinologists in Bergen County, I was searching for a doctor who would spend the time and take the effort to better understand my symptoms and work with me. Dr Parikh was just the doctor I’vebeen looking for. She sat down and had a discussion about my symptoms, took the time to explain the latest research and treatment pathway . I highly recommend her. Fast, friendly, very helpful and extremely professional. Excellent doctor, very knowledgeable and proactive. I barely had the time to finish the paperwork before she saw me. Very helpful office staff as well. The waiting area looks like it belongs to a plastic surgery practice, so I was like, am I in the right place?? I arrived and there was no receptionist at the desk, so I signed in and sat down. I couldhear people chatting somewhere, but no one came out to see me. After some time I called out, concerned I'd sit there forever if I didn't. I wasn't impressed. But Dr. Parikh makes up for her unprofessional staff. She seems great. But oh lordy, when I had to have blood taken, that was terrible. I have a chronic medical condition and get blood taken very often. I'm somewhat of an unfortunate connoisseur of phlebotomists. Dr. Parikh's was the worst I've had in a long time. She acted like she didn't know what she was doing. I actually screamed out because it hurt so badly. So if you go there, brace yourself! It was really nice and informative. She checked all records and listened to me patiently. Understood my concerns and advised me about what to next. She’s nice and made me feel very comfortable! The doctor was awesome! Very patient explained everything in detail and made me comfortable and put me at ease. The only comment I want to make that is ‘negative’ has nothing you do with her, but her staff who seem inexperiencedas well as where my blood was drawn. Similar to another review I did not feel comfortable or safe. Next time I’m there I will say something to the doctor. Very nice and explained steps of testing. Went over medical history and very thorough. The doctor was pleasant and professional but the reception staff was atrocious. I made an appointment on zocdoc and called to confirm the day before because it still said pending on the app and they told me that my appointment timewas fine. They called me later in the day and told me that my appointment time wasn't good and I was irritated because I had already reached out to confirm- they told me I could come in at 10:45 and I said that wasn't acceptable do you have earlier- so I get there at 9:45 and they kept me waiting until 11 which was absurd. There was also no one in reception for a whole ten minutes and they almost seemed bothered that I appeared to be in a rush. I'm as patient and polite as they come but these people really pushed my buttons. After reading these reviews it's clear I wasn't the only one with this experience. Very very unprofessional. Re-hire soon you will lose business with these people. Very professional in the way she handled everything would definitely recommend her. The issue I'm having is the receptionist is never available and I've been standing in front of her empty desk for ten minutes. This is the second time I come into an empty office where there is no receptionist on sight.Last time I was here, it was at 11:00am and I had to wait for the phlebotomist to finish her conversation with her co-work and to pick what she want d for lunch, mind you I was literally the only person in the office . It took 45mins for me to get my blood drawn. The doctor's office does not look professional where there's boxes and papers everywhere. It looks very messy. The blood drawing station is on a makeshift desk. I definitely did not feel totally confident with them drawing my blood. I recommend another practice. The wait was entirely too long. An hour had passed from the time I arrived till the time I saw the doctor and I was the first patient. I was a new patient, it did take some time to fill outmy paperwork. That being said, there were things that could have been taken care of while I waited. She could've reviewed my labs I brought with me - vitals could have been taken. By the time I saw Dr. Parikh I was thoroughly annoyed by the wait time and aggravated by the temperature in the office. It was at least 90 degrees inside and it was a pretty warm day. Dr. Parikh was also short with me - I did not feel like she was listening, she asked questions and cut me off while I was answering. I didn't appreciate it, it made me not trust that she understood what I was trying to accomplish and I felt she didn't care. Took time to talk to me about a lot of options & how I can best treat my diabetes. Dr Parikh seemed knowledgeable and caring however she tried to tell me what was wrong with me based off of a 2016 blood test and we are in 2018. Part of the mix up with the current blood test was myfault however, I agreed to take another test. My advice is before going to any specialist have your most current records in hand. Don’t depend on the office to get it. Her office has 20 other doctors! Very confusing! Office never called with results.. I have been to so many doctor and she was the first one who made me feel comfortable and heard me. She is very kind and humane! Highly Recommend! Dr. Parikh is really kind and humane. She gives you time to ask any question you have and is very knowledgeable. She sees you not only as a patient but as a human being. I highly recommend her. She was very good. Took her time making sure I was comfortable and ordered the right tests for my condition. Very thorough, gave me options and alternatives. Explained everything well. Great bedside manner. Highly recommend!!! Very helpful and thorough. Very kind and caring. Nurses we're extremely nice as well. She took the time to listen and I felt at ease. Overall it was a good visit. Staff members are friendly, Dr. took me in right away, provided helpful feedback & listened when I said I wasn't interested in something/type of treatment and offered the pros & cons of my choice. She doesn’t seem to want to hear everything the patient has to say. I was 5 minutes late for my appointment because my GPS caused me to miss an exit and I had to go into NYC to turn around andcome back. She told me: "If I had another patient after you, you would not have been seen today." People don't go to doctors for a social visit. They go because they are ill and expect to get proper medical care. Dr. Parikh is very nice and asks a lot of questions to get a good overall picture. I am glad to have found somebody who can advise me on hypothyroid issues and I'm looking forward to my next appointment with her. The wait was too long, especially since we already filled forms ahead of time through zocdoc. Also they need to learn the protocol for patients under Cobra. The doctor was thorough, however and added a test I requested. Overall, I hada decent experience but would not want to wait so long next time. The front staff person was very professional and pleasant.